Let's face it: juggling hundreds of contracts at once isn't most people's idea of a good time. However, if you work as a contract, legal, or procurement executive, or have an administrative role that requires you to stay on top of contracts within your organization, then you're all-too-familiar with the struggles that come along with this type of work. Depending on the size of your business, you may have dozens or even hundreds or contracts to manage at any given time. Unfortunately, humans are imperfect creatures, and it's only a matter of time before a mistake will be made with a contract. You may miss a renewal deadline, or perhaps you'll even lose a contract in the shuffle. Because contracts are becoming increasingly electronic documents, you might want to consider implementing some form of contract lifecycle management software within your organization. A contract lifecycle management solution allows you to easily track and maintain all of your contracts electronically. Modern cloud software providers are surprisingly cost-effective, efficient, and secure. Why Implement Contract Lifecycle Management Software? In today's economy where businesses of all sizes are looking for creative ways to scale back on spending, why would you want to take on another software-related expense? There are plenty of reasons, actually. When was the last time you struggled to click through a dozen screens in search of a vendor contract? Or the last time you misplaced an important contract you know you had saved on your computer? If you work with contracts on a regular basis, it probably hasn't been very long. When you have a contract management program, all of your contracts are digitally and conveniently stored in one place, making them easy to locate and manage. Plus, easy-to-use search functions make it possible to find the contracts you're looking for using simple keywords, or to group your contracts by tags, which means you spend less time scouring for documents and more time being productive. In addition to making your job easier, contract management software also reduces risk in a number of ways. For instance, many of these programs allow for easy auditing, proactive compliance management, and other features that give your organization greater confidence and peace of mind when dealing with contracts. Automation and reporting features help you analyze the performance of contracts and prevent anything from slipping through the cracks. Finally, a cloud software provider will have dedicated permissions, access, and encryption features to ensure the only people who see your contracts are the ones who were meant to. No matter what industry you're in, time is money. When you (and other contract management professionals) are spending less time searching for contracts, monitoring milestone dates, and the like, you're able to increase productivity. In turn, this saves your organization money. The costs associated with implementing a contract management software program can pay for itself many times over down the road. If you're thinking about implementing some form of contract lifecycle management software within your company, you might be wondering where to begin. An initial search of relevant programs may yield hundreds of results, which can undoubtedly make the process of choosing one seem a bit overwhelming. Fortunately, by taking a few important factors into consideration as you compare vendors, you can ultimately make the right choice for your organization. Prices for contract management software can vary greatly depending on the specific features you're looking for, so it's always a good idea to get started by determining your organization's budget. You'll also want to consider whether you'd prefer purchasing the software outright or paying a monthly or quarterly subscription; each option will have its inherent advantages and disadvantages. - what's your estimated cost for system maintenance annually? - do you allow a free trial before purchasing? - what's the process for upgrading or changing the software, and what will it cost? You'll want to look at your purchase of contract lifecycle management software as an investment in your company's future. It only makes sense that you'll want to find out which software option will provide your organization with maximum time (and thus money) savings. Don't just go with software that's bursting at the seams with features; quantity does not predict quality. Instead, focus on software that provides the features that matter most to your company. These features will vary depending on where your greatest bottlenecks are. As an example, if most of your organization's contract management pain lies pre-signature- in the approval process, during authoring, etc. then you should focus your search on the software that streamlines this part of contract management the most. However, if most of your pain comes post-signature- in monitoring milestones, locating contracts, ensuring compliance, and reporting on the contract portfolio, then your search should focus on software that serves these needs first. Usually you will find that strengths in one area of contract management do not necessarily mean strengths in all areas. The right software for your company will have strengths that directly overlap with your needs. The best way to make sure a particular program is a viable fit for your business is to define your business needs and contract processes in detail when you first reach out to the software company. From there, you can request them to show you a customized demonstration of how their software would work to make those processes easier and more streamlined. When shopping for the right contract lifecycle management software, it's also important to consider where your organization currently stands and what kind of growth you expect in the future. For example, if your business is still relatively small, you may only need basic software to help you manage a handful of contracts at any given time. However, if you expect significant growth in your business over the next couple of years, then it might make more sense to go with a software program that will be capable of growing along with your business. This will save you from having to seek out another contract management program down the road and also save you the hassle of having to go through the implementation process all over again. 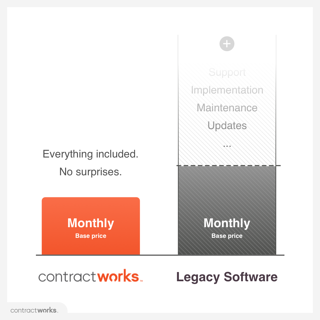 This is where cloud contract lifecycle management software really shines. Cloud software has virtually unlimited scale, and maintenance and updates are all performed automatically and in the background -- there's nothing you need to do as your business grows except enjoy the time savings of software that supports you behind the scenes. There's simply no overstating the importance of security when it comes to your business contracts. No matter the industry, contract security is paramount, and so you should verify that your contract management software provides robust security features. At bare minimum, contract lifecycle management software should provide two factor authentication, permissions & access management, and encrypted data storage. Additionally, check to see who at the company will have access to your data. While it's common practice at some companies to allow support staff to access data, ideally you will want a solution that provides no access to employees- even to support. At ContractWorks, we also include a selection of other powerful security features. We watermark all contracts with the name of the person viewing the document and the current time, so if anyone were to try and screenshot your contracts, you'd know exactly who and when. We also provide central control for access management, so you can decide who gets to see what contracts, and whether they can download or print those files. Finally, we provide audit logs so you can see the activity of every single person in the system. Curious who accessed a specific contract in the last 30 days? You can do that with ContractWorks. Regardless of what provider you choose, make sure your software comes with robust security features to protect your contracts. Contract lifecycle management is about more than organization and storage. As a company, you need insight into the performance of your contracts, and you'll often need to take continued or scheduled action on those contracts. A quality contract management provider should include reporting features that make understanding your contracts as simple and insightful as possible. Most software providers will allow you to select from standard reports. These reports often include upcoming expiring contracts, all contracts within a set date range, and recently modified documents. - Tag documents with absolutely any parameter you want and report on that. - Create and schedule reports so they arrive in your inbox exactly when you need them. Implementing new software is never a fun experience—and this can be particularly true if you have a large number of employees who will need to be trained on how to use the software. This can eat up a significant amount of time, money, and resources for your business. As a result, it's important that you find a contract lifecycle management program that has the greatest possible ease of implementation and use for your employees. This way, you can spend less time and money getting the software implemented and more time using it to your company's advantage. When looking into potential contract management software be sure to find out how long the company anticipates the implementation process to take. This can help to narrow down your options from the start, as you can automatically rule out some of the software options that will take too long to implement. Of course, ease of use is another important factor to keep in mind. The more intuitive a contract management program is to use, the easier it will be for your employees who have access to it to utilize it properly. This means you spend less time, resources, and company money on training. Last but certainly not least, you'll want to take time to research the reputation of the software company itself. Does the company have any recognizable customers or partnerships that indicate reliability? Do they provide easy access to a demo or free trial of the product? Is their pricing transparent? Perhaps the best indicators of a company's reliability and how much people enjoy the software are online reviews. By reading reviews from customers away from the company website, you can see an unbiased picture of how well the software is viewed. The most reliable aggregator of reviews for business software like contract management is Capterra. There, you can see reviews of all top contract lifecycle management software providers. Overall, selecting the right contract lifecycle management software is a major decision and one that should only be made after great consideration. By keeping the above factors in mind and always keeping your organization's specific needs at the forefront, you should ultimate be able to reach the right choice for your company.